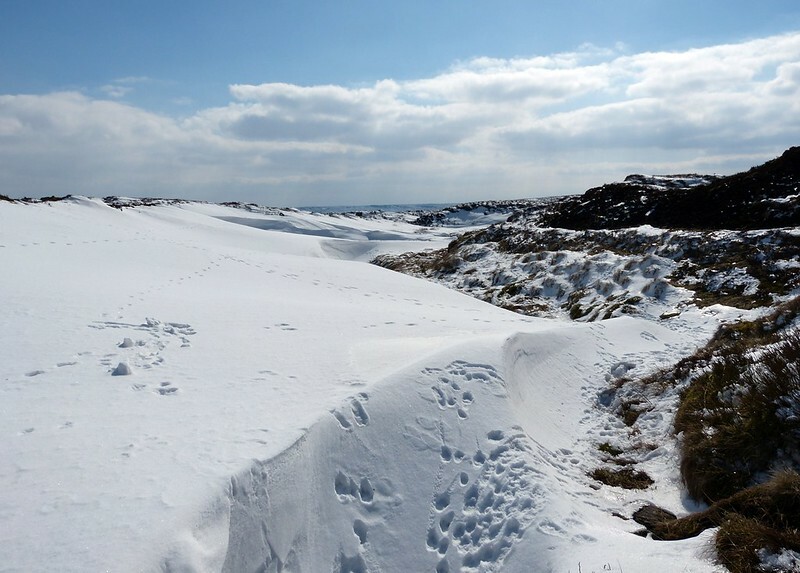 Bleaklow, widely regarded as one of the hardest navigable landscapes in the Peak District, may at first glance seem like a strange place to walk following heavy snowfall. For us though that challenge was the very thing that drew us there in the first place and I'm happy to report that our mountain skills were more than up to the task. As my last post shows our efforts were well rewarded with superb sightings of Red Grouse and Mountain Hare, but the Dark Park had so much more to offer. 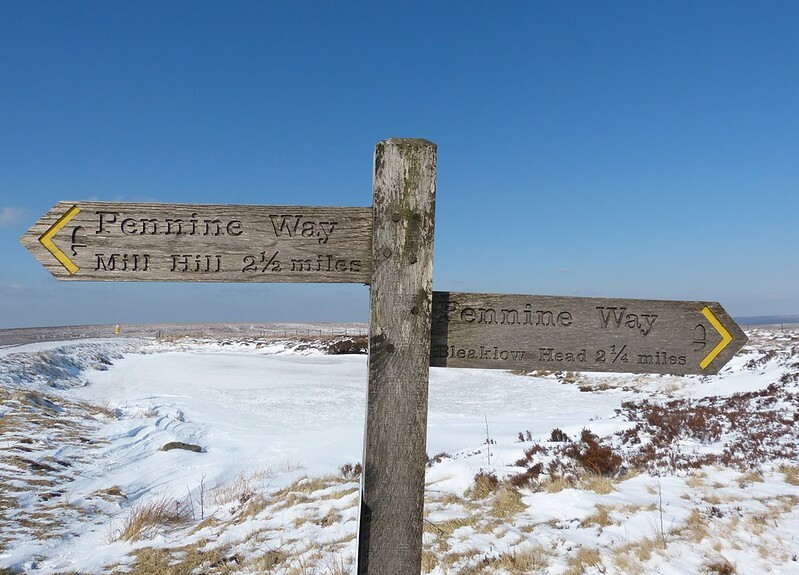 Firstly there was the chance to walk along part of the legendary Pennine Way, though at times the drifts were so deep that without a map its course was pretty much indistinguishable. 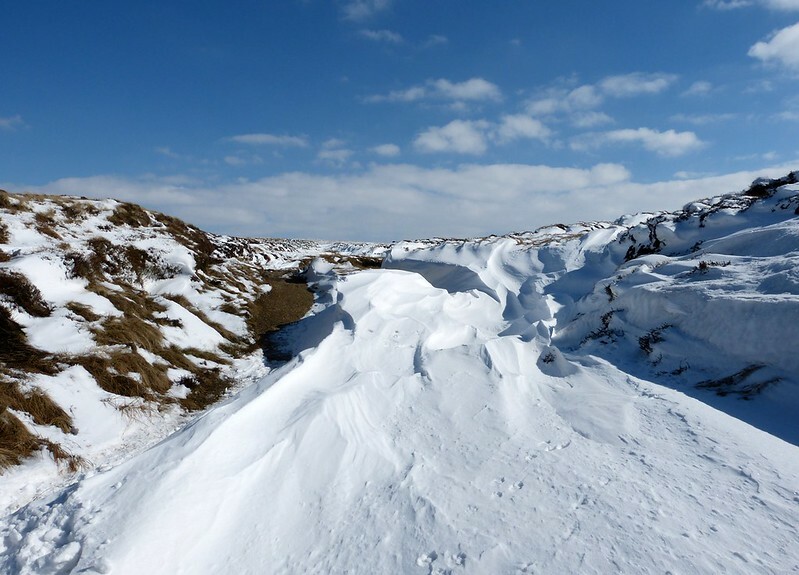 In places the snow that looks so solid in the photos above would simply give way beneath our feet. 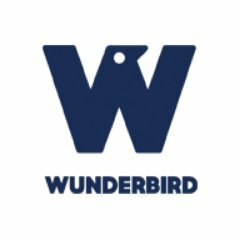 Often there would be no warning of an imminent collapse and each of us found ourselves at least knee deep on a number of occasions. Fortunately the ground was so frozen that the underlying peat bogs didn't hold any nasty surprises and the worst we came away with was a grazed shin. Even so it did make for tough going until we split from the main path to head across to Higher Shelf Stones. 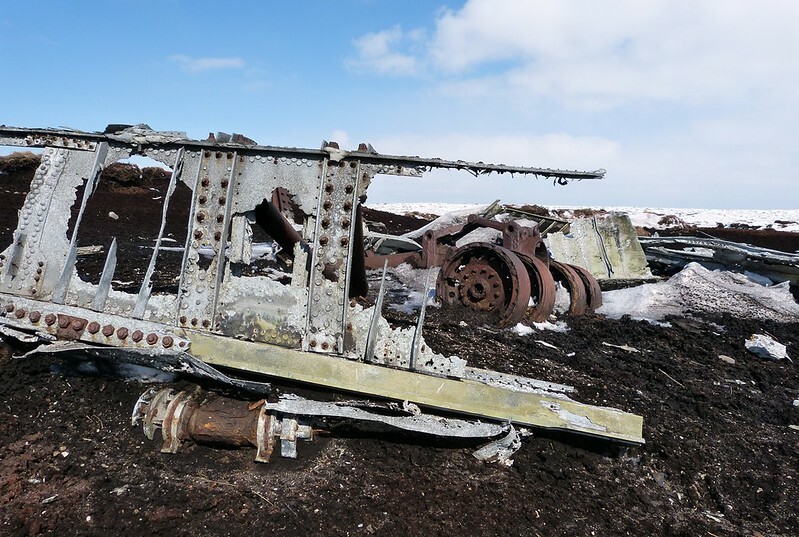 Here we were greeted by a scene of almost total desolation, much of it shaped during one tragic day in 1948. 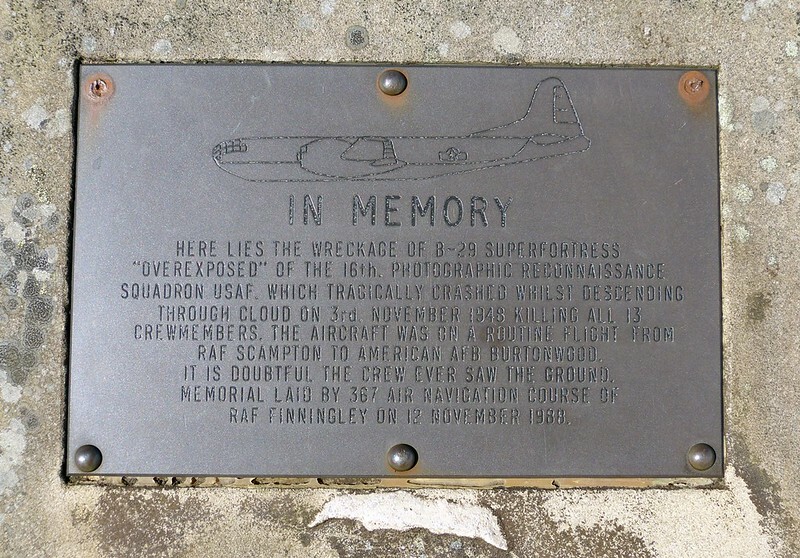 On the 3rd November that year Boeing RB-29A 44-61999 of the 16th Photographic Reconnaissance Squadron, better known as "Overexposed", was on a routine flight from Scampton to Burtonwood. Conditions were not ideal with low cloud over the hills forcing the crew of thirteen to rely solely on their instruments for navigation. 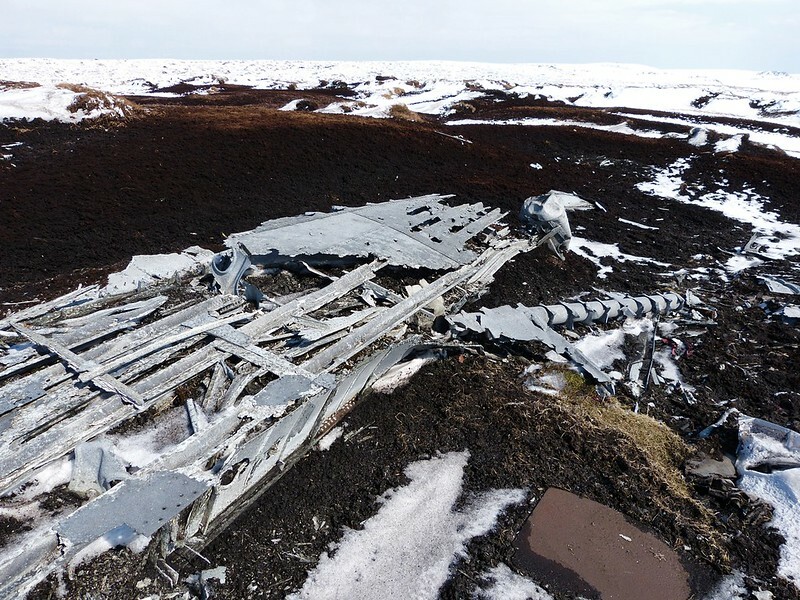 Having flown for what they believed was the correct length of time to pass Bleaklow they descended, tragically a few meters short of where they believed they were. The impact was severe and the ensuing inferno claimed the lives of all aboard. 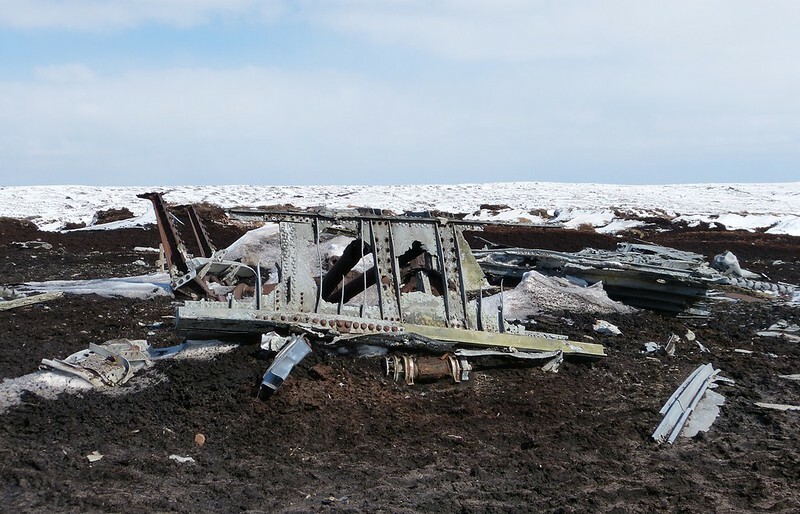 Even today the wreckage is spread far and wide with many sections of the plane still readily identifiable. Between two of its massive engines sits a simple memorial lest we forget those lives which were lost. 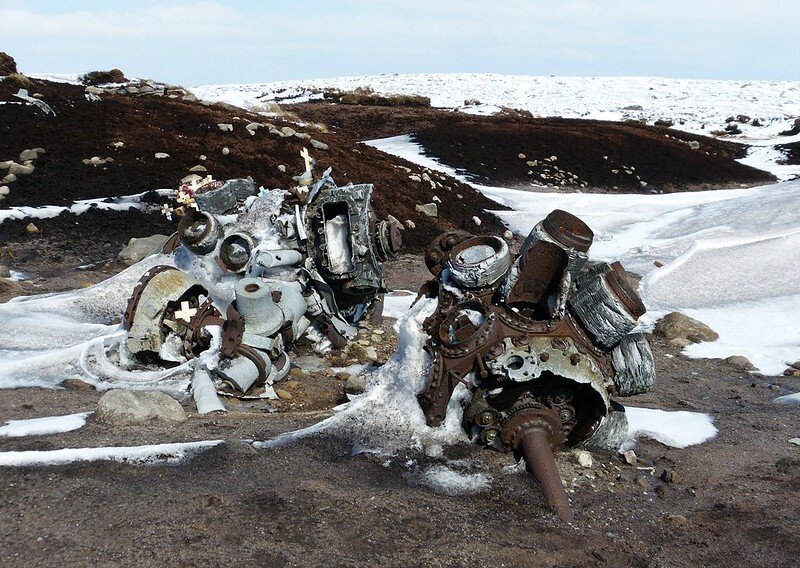 For me this crash site was the most evocative of any that I've visited to date. 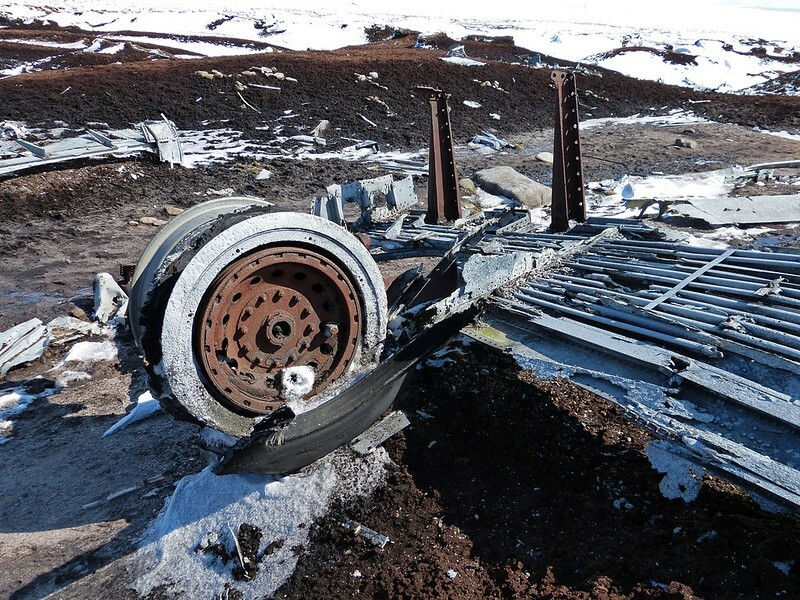 Whether that was the sheer scale of the wreckage or the strange lack of snow surrounding it, I couldn't tell you. A short distance away sits a trig point affording superb views back down to our base in Glossop. With the wind picking up the huge gritstone boulders offered welcome shelter for a spot of lunch. 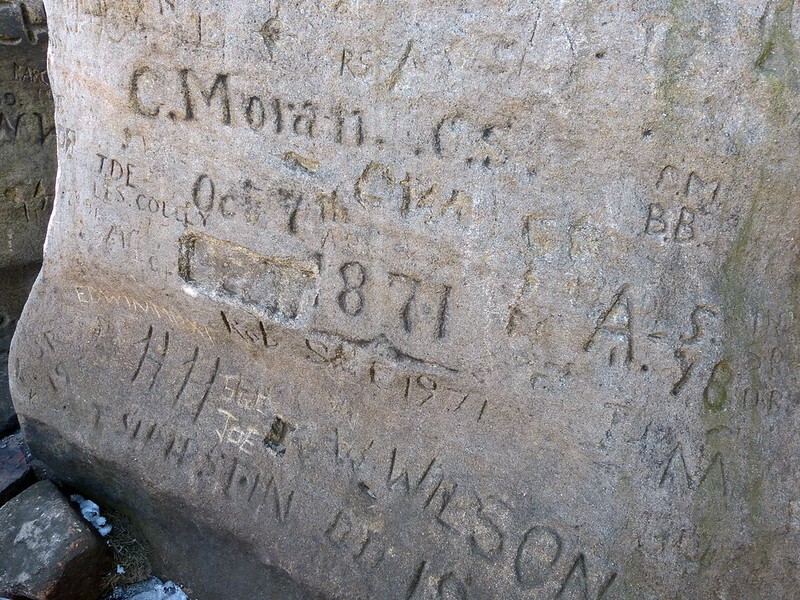 Judging from the carvings across their surface, some dating back well over a hundred years, I doubt we are the first or indeed will be the last to have done so. Suitably refreshed we headed over to Bleaklow Head following two further outcroppings of gritstone boulders. The going was much easier here due, according to a fellow walker, most of the snow having been blown off the top and straight down into the valley below. 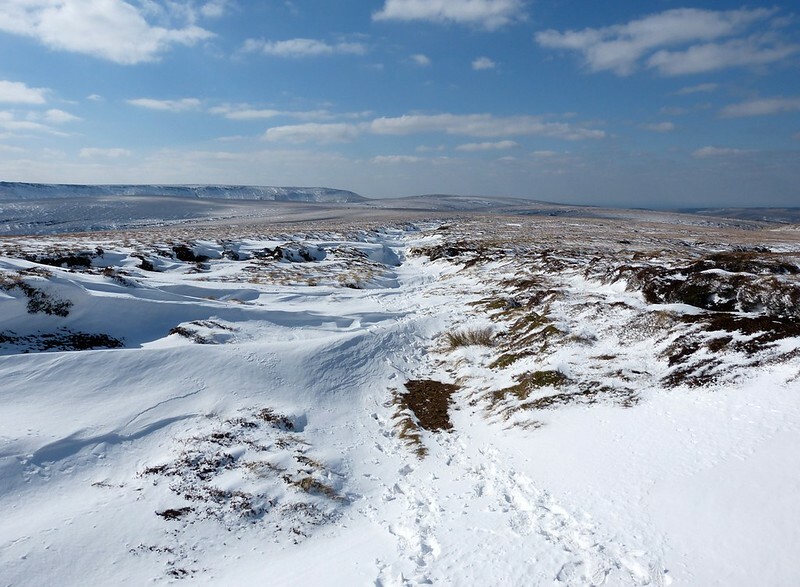 In contrast the Pennine Way in its more sheltered location was virtually impassable when we attempted to rejoin it for the return leg. I think we set off on the correct course initially but in the end had to abandon it and make our own route back to the car. The scenery was still just as stunning. As we dropped lower it became noticeable that the snow was definitely thawing in comparison to our morning departure. 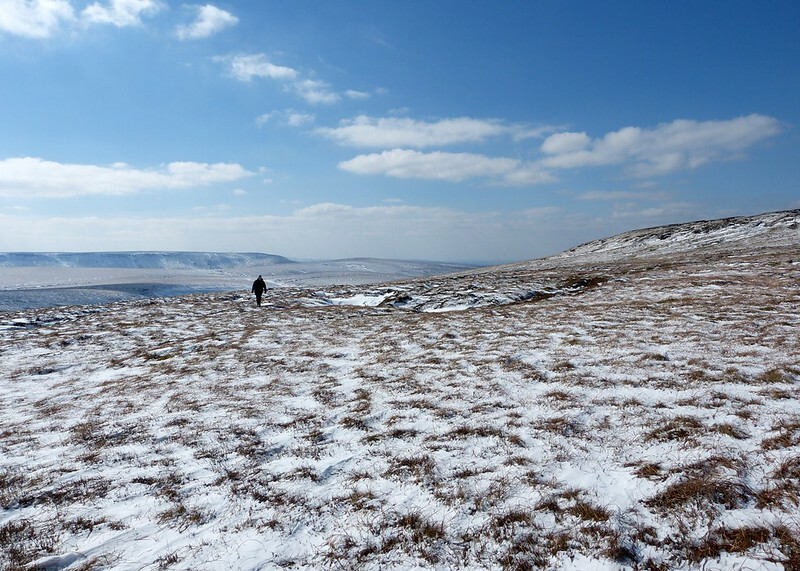 With the improving conditions came an increase in walkers and a loss of the solitude we'd enjoyed for much of the day. Never fear though as there was plenty more of both to come over the next couple of days.